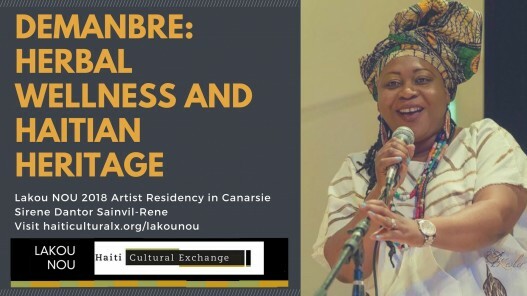 Join Haiti Cultural Exchange’s Lakou NOU 2018 artist in residence Madjeen Isaac for an art exhibition and open discussion regarding cultural identity. What if Flatbush were its own Island? This exhibition of the Flatbush area reveals a juxtaposition between urban and tropical landscape. Unusual yet nostalgic because it feels like home. From merchants selling herbs and vegetables on the street, to cab drivers transitioning from tap-taps to dollar vans, these small businesses provide leeway for immigrants to adapt and work towards new opportunities. These paintings serve as a learning point about the lives of Haitian immigrants and first generation Americans residing within the community. That the Q train to Beverly Rd Station, turn left and walk 5 blocks. Madjeen Isaac (Flatbush) specializes in oil painting, as she focuses on creating images based on her Haitian American culture. Growing up in a neighborhood where it is predominantly Caribbean immigrants, Isaac allowed her process to give her a sense of purpose from the memories and cultures that have shaped her. She says, “Flatbush is where I have lived most of my life. Flatbush is a place that emits culture and hustle. Overtime, I have developed a concern for immigrant youth and children of immigrants, becoming “Americanized” or assimilated out of fear, without reflecting back on the culture of their ancestors”. Her works are based on celebrating one’s existence and differences while showing patronage to the Haitian culture. Madjeen currently attends the Fashion Institute of Technology, and is expected to receive her BFA in Fine Art, May 2018. 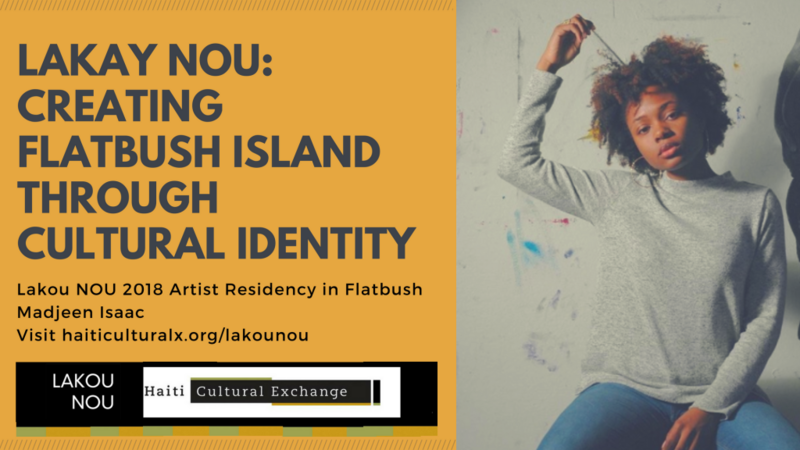 Her Lakou NOU 2018 project, Lakay Nou: Creating Flatbush Island Through Cultural Identity, stems from her last two years at the Fashion Institute of Technology; the recent works she created there are based on Flatbush itself, “…the neighborhood that has shaped me as well as contributed to my Haitian American upbringing.” Throughout her artistic journey, the cultural fusion she’s created with Brooklyn and Haiti landscapes allowed for her to tap into how her Haitian roots are manifested within everyday life in Brooklyn, and how immigrants have rebuilt their lives after settling in Flatbush. The inherited lifestyle of hustle that Caribbean immigrants seem to withhold reveals their resilience through their long standing businesses such as, their transportation services known as tap-taps, storefront churches and merchants selling herbs in the street imported from the islands. All of which I have incorporated into my paintings. Although I was fully invested in the idea of merging both urban and tropical, my process also allowed for me to compare my younger self and my present self. Breaking barriers of stigmatism I’ve always been taught to believe of the place my parents came from. I realized that during my painting journey, the works I’ve created were deeper than merging two worlds together. It allowed for me to understand why preserving my observations and showcasing my perspective was crucial for me to claim my Haitian American identity. 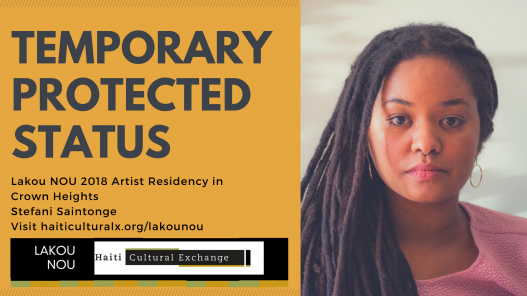 Join Haiti Cultural Exchange’s Lakou NOU 2018 artist in residence Stefani Saintonge for a discussion and screening on deportations & TPS. Throughout 2018, Stefani Saintonge has gathered anecdotes from TPS holders and their family members in Crown Heights and throughout Brooklyn, documenting their journey to the US, their work since arriving here and their current state in order to highlight the human stories behind this issue. Some of these interviews were conducted on camera, based on the comfort level of participants. Saintonge has also looked to capture knowledge from field experts and community leaders on the current state of relations between Haitian immigrants and the US. 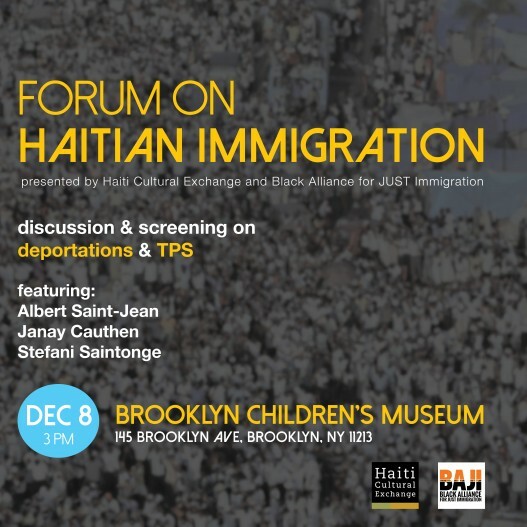 Saintonge will offer select excerpts from interviews and observational footage and join in discussion with organizers Albert Saint-Jean (BAJI, Black Alliance for Just Immigration) and Janay Cauthen (former wife of Jean Montrevil, Co-Founder of New Sanctuary Coalition of New York City). Take the 3 to Kingston Ave, A/C to Nostrand Ave, or C to Kingston/Throop Aves. Stefani Saintonge (Crown Heights) is a Haitian-American filmmaker and educator. In 2014 she won the ESSENCE Black Women in Hollywood Discovery Award for her short film, Seventh Grade. Her documentary, La Tierra de los Adioses, won Best Latin American Short Documentary at the Festival Internacional de Cine en el Desierto. Her work, which focuses on women, youth and immigration, has screened at several festivals in the US and abroad. A member of New Negress Film Society, she is a recipient of the Jerome Foundation Film and Video Grant, and works as an educator and adjunct professor in New York. She holds an MFA in Documentary Film Studies and Production. For her Lakou NOU project, she intends to research current TPS holders as well as community leaders and activists fighting to have it extended. There are currently 58,000 Haitians with Temporary Protected Status (TPS), with 20,000 living in New York. The US granted TPS in response to the 2010 Haiti earthquake, which declared that any Haitian immigrant residing in the US without permanent residency could apply. The Obama administration had consistently extended the program, but the Trump administration intends to put a stop to it leaving the 58,000 at risk to losing their documentation. TPS is due to end by July 2019 making this year a crucial moment. From May to August 2018, she will work within Brooklyn particularly Crown Heights to gather anecdotes from TPS holders and their family members documenting their journey to the US, their work since arriving here and their current state in order to highlight the human stories behind this issue. The interviews will be conducted on and off camera depending on the comfort level of participants. She will also interview people in Haiti inquiring on their plans in case their family member is forced to return. In addition, she will conduct on-camera interviews with experts and community leaders. She plans to bring together the TPS families she would have been working with for 2-3 private events where they can meet each other, connect and share in an attempt at collectivizing. She will invite a community organizer for one event to do training on self-advocacy, and, an additional event will feature a community healer for a group talk on strategies for managing anxiety amongst state violence. During her final project event, she will present the resulting footage at a space in Crown Heights for a public, educational forum on the current status of TPS to inform audiences interested in the struggle. The event will blend facts, personal anecdotes, excerpts from interviews and observational footage. She will also invite willing TPS holders as well as community leaders to participate in the forum. The goal at the end of her residency will be to generate an audio/ visual record of current Haitian TPS holders as well as use the collected footage as foundational research for a possible in-depth film to be completed in the future. 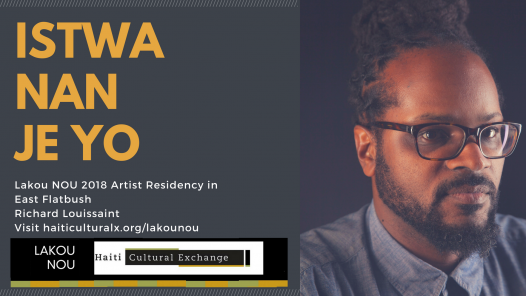 Join Haiti Cultural Exchange’s Lakou NOU 2018 artist in residence Richard Louissaint for a film screening and discussion. Places, whether it be a childhood home, the local bodega, the park you spent your days during long summers, hold some sort of significant memory that seem insignificant until you recall it. Louissaint’s culminating Lakou NOU event will feature an exploration of change and history in Haitian East Flatbush through the words of Haitian organizations and businesses. With special guest Herold Dasque, Community Relations Consultant for Haitian-Americans United for Progress. Follow the progress of Istwa Na Je Yo here. That the 2 or 5 train to Beverly Rd Station. Walk 2 blocks south along Nostrand Ave.
Richard Louissaint (East Flatbush) is a first generation Haitian-American filmmaker and photographer from New York City. Growing up in Queens, he was exposed to a wide spectrum of the Caribbean diaspora but was primarily influenced by Haitian and African-American culture. His obsession with music led to him to writing for music magazines and websites before pursuing a career as a photographer and filmmaker. His work centers on people of color, especially those of Haitian descent, through portraiture, film and documentaries. He has been published in Wax Poetic Magazine, MTV and the New York Times. His work has been exhibited at the Brooklyn Museum, Wilmer Jennings Gallery at Kenkeleba and he had his first solo show in Petionville, Haiti in 2014. His films have screened at the Haiti Film Fest, New York Short Film Festival, and Newark International Film Festival. Richard also holds a MFA in Creative Writing from Brooklyn College. As his primary course of action, Richard will communicate with businesses in East Flatbush – young and old – to document their stories, their perceptions of the community, and to help enforce their ability to succeed. This work is timely as it occurs with the launch of the Little Haiti Business and Cultural District. Richard hopes to use this as a launching pad for building connections with his lakou.